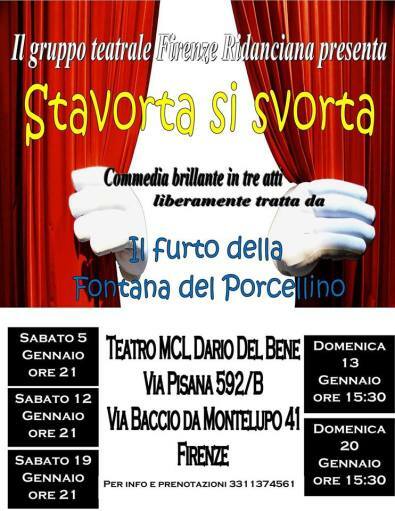 Saturday 12 and 19 January at 21 and Sunday 13 and 20 January at 15:30 at the theater of the Circolo MCL Dario Del Bene is staged the fun theater comedy "Stavorta s'vorta" (it is not a grammatical error, it is so , in toscanaccio) freely taken from "The theft of the fountain of the porcellino", and realized by the company Firenze Ridanciana. "The comedy takes place in Florence, just before the flood of November 4, 1966 - tells us Raffaello, one of the actors - when a rich American widow decides that the famous fountain of the pig, for centuries in the center of Florence ... is better In the United States, to steal it, he turns to a handful of three unfortunate heroes: an umbrella-maker, a grinder and a chimney sweep ... They will be three acts full of exhilarating sketches and gags!